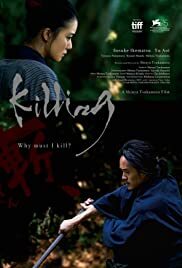 KILLING is a samurai action flick set in the era when samurais were roaming the land seeking for Masters to serve and to pay them for fighting (for them). Samurais were still highly respected and many men wanted to become one. Killing tells this familiar story but with more drama and authenticity. The film looks like Akira Kurosawa’s RASHOMON where a large part of the action takes place within a forest with the sun shining through the trees Director Mokunoshin Tsuzuki (Sosuke Ikematsu) is one such samurai, a warrior without a war to fight. Impoverished by the long-lasting peace of mid-19th-century Japan, he makes a living by helping farmers in a small village. Life in the countryside flows uneventfully, between farming chores and playful daily sparring with Ichisuke (Ryusei Maeda), the hot-blooded farmer’s son who dreams of one day becoming a valiant samurai played by director Tsukamoto himself. But the peaceful surface of the days belies hidden passions, an unspoken attraction for Ichisuke’s sister Yu (Yu Aoi), a looming sense of danger, and many doubts. The swords fights are edited too fast for one to really discern what is going on, but the excitement is still present.